It just feels like yesterday only when me and Debu met on a matrimonial website and now as if with the blink of an eye, we have spent 4 years together in our marriage. How fast time flies. Tomorrow being our 4th wedding anniversary calls for some celebration. Sadly, tomorrow is Monday and Debu has office. Stuck amid a busy schedule of project based work, it's difficult for him to take a day off. So I planned to treat him a special dinner on Sunday itself. To add a special gesture, I baked his favourite banana muffin as dessert. While preparing banana muffin, take care of two things. Banana should be ripe. The ones sold in the market with yellow skin are great to eat as raw, but not suitable for preparing muffins. Keep the bananas in open for two days till they ripen into brown flesh. 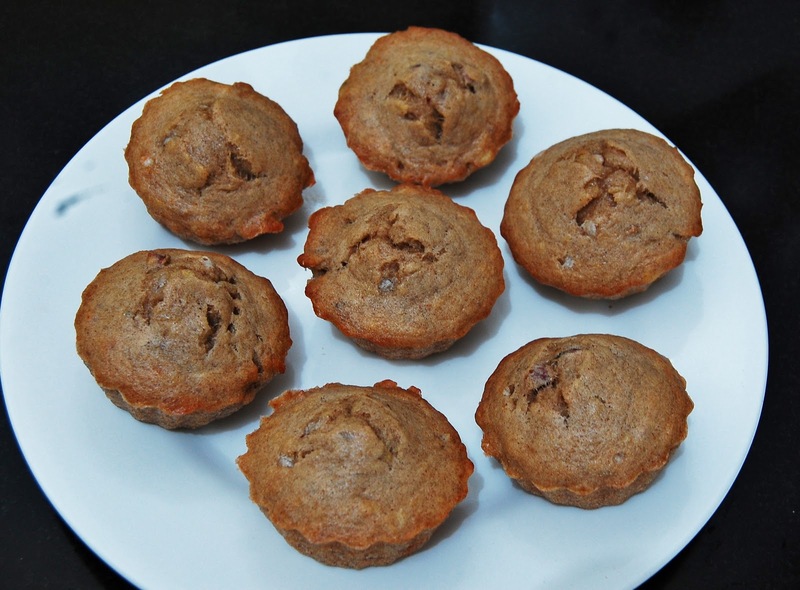 The moist texture and sweetness of brown bananas are of the essence. Secondly, when you fold flour with the wet ingredients, don't over mix. Over mixing the batter leads to less pores inside the mixture tautening the muffin. By the way, the recipe described below applies to the preparation of banana cake also. Just use a normal baking tin instead of muffin trays. That's it. 2) In another bowl, mix in mashed bananas, vanilla extract, melted butter and eggs. Whisk the mixture well to make a smooth batter. Then gently pour this wet mixture into the dry one, combine well till batter becomes thick. Please remember what I mentioned above, don’t over mix. Over mixing hampers perforation and the muffins would turn out tight and springy. 3) Preheat the oven to 180 degrees C (350 degree F). Grease the muffin tins with half spoonful of butter in each and scoop out the batter into them. Position the tray in the middle of the oven and bake for about 15 minutes till a toothpick inserted comes out clean.